With increasing sprawl, shadow IT, and siloed investments, enterprises have bought dozens of IT discovery tools (some have invested in 30+ different tools for discovery!) to regain control over their asset landscape. While application discovery and dependency mapping tools are not new, it’s no easy task keeping track of IT assets across legacy and modern IT environments. What if you had an innovative solution that could discover datacenter and cloud assets, serve as a system of record for long-lived as well as ephemeral assets, and deliver a live asset inventory across your enterprise? Today, we introduce our latest solution, Unified Service Discovery, that helps you locate any IT asset in one click, shows how your asset base is evolving, and lets you understand asset utilization trends over time. Figure 1 - Support a diverse ecosystem of datacenter and cloud-native assets with OpsRamp. Optimize Service Delivery. Unified Service Discovery includes Service Maps, a logical model of your IT services that let you analyze the impact of your IT assets on your business services. You can define Service Maps for IT services that depend on a set of transactions, apps, virtual servers, network devices, and multi-cloud workloads. Service maps display dependencies intuitively and enable you to browse through service tiers while troubleshooting issues. Use Service Maps to align your operational tasks with the digital experience you want to deliver for your end-users. Figure 2 - Construct a complete picture of your critical services using Service Maps. Multi-Cloud Asset Visibility and Spend Analytics. How do IT teams better handle consumption, spending, and optimization for multi-cloud management? With Unified Service Discovery, you’ll gain the right operational insights for multi-cloud visibility, consumption planning, chargeback, and budget controls. 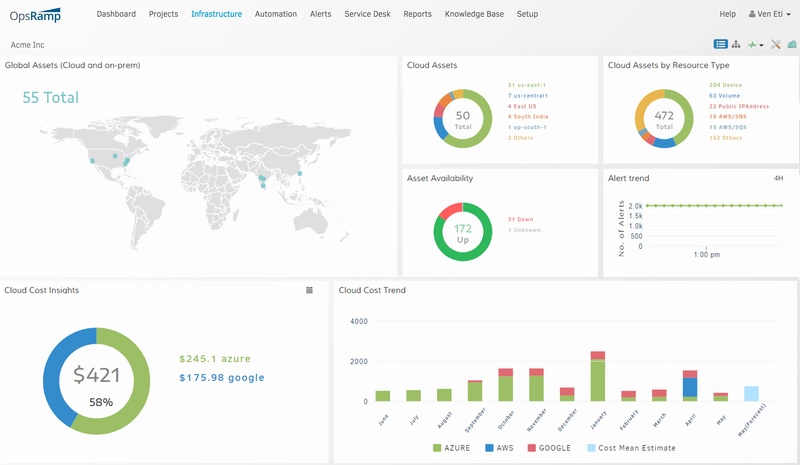 Our multi-cloud executive dashboard offers complete asset visibility for understanding your total asset footprint across public cloud providers. You’ll gain cost visibility for each cloud provider along with current spend and cost trends for each of your business units. Finally, gain control over cloud costs by detecting unused and underutilized instances. Figure 3 - Analyze cloud spending across service categories, instance types, and regions. Of course, with OpsRamp, discovery is just the beginning. Once you can track your assets, you can then turn those insights into action with Unified Service Intelligence. It’s the perfect complement to Unified Service Discovery, with infrastructure performance monitoring and smart event management built to extract the signal from the noise for your alert floods. It’s the natural progression from visibility to intelligence. To get started with Unified Service Discovery and see immediate value, sign up for our IT Asset Visibility Challenge today! Give us 48 hours and we’ll show you how you can establish visibility for your enterprise IT infrastructure. Read our press release on Unified Service Discovery. Learn more about OpsRamp’s Unified Service Discovery and the 48-hour IT Asset Visibility Challenge. If you would like to schedule a demo to see OpsRamp in action, contact us today.